Atlantis’ next mission to the International Space Station (ISS) has avoided a potential range conflict with a Delta IV launch by negotiating – with the United Launch Alliance (ULA) – priority for a window that will open on May 14. Meanwhile, repairs are nearly completed on Atlantis’ External Tank (ET-136), following observations of delamination on the -Y PAL (Protuberance Air Load) foam. Atlantis is currently tracking rollover to the Vehicle Assembly Building (VAB) on April 12 – although this date is subject to both the timely launch of Discovery on STS-131 and potential impacts downstream – such as the pending test results from Holland with STS-134’s AMS-2 payload. Regardless, mating of ET-136 and the twin Solid Rocket Boosters (SRB) will take place on March 29, where they can happily set up camp in the VAB, should there be an impact on the rollover date for Atlantis. “OV-104 (STS-132): In OPF (Orbiter Processing Facility) Bay-1, continuing with midbody closeouts. Targeting closing Payload Bay Doors (PLBDs) on Tuesday. Continuing the work on the RCCs with the LESS panel installation,” noted KSC Launch Integration (L2). “Continuing with TPS (Thermal Protection System) processing on the nose landing gear door. Providing for the May 14 launch date, ULA have allowed for Atlantis to take the priority on the range, with the Delta IV mission carrying the US Air Force’s first Block 2F navigation satellite for the Global Positioning System (GPS 2F-1) waiting until either STS-132 launches, or scrubbing for an extended period of time that would result in handing over the range back to the EELV. The Delta IV launch is scheduled to for May 17, although it takes up to two days to reconfigure the range between shuttle launches out of KSC and other launches out of Cape Canaveral. The agreement will likely see Delta IV agreeing to slip should Atlantis fail to launch on the first or second attempt. The full details of the deal have not been provided at this time. Atlantis is being processing for her STS-132 mission that will be the 132nd flight of the Shuttle Program and the 34th shuttle flight dedicated to construction and outfitting of the International Space Station, as she carries up a largely Russian payload. 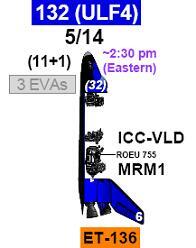 She will head into STS-335 processing – potentially becoming STS-135 – upon her return. Atlantis is currently working no IPRs (Interim Problem Reports), following the clearance of what was only the 17th issue during her flow, relating to an elbow camera retest on the Remote Manipulator System (RMS), which was completed with nominal results. 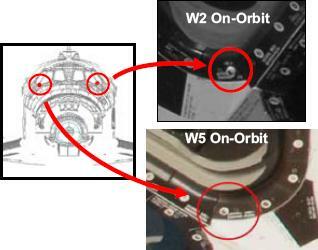 Engineers have been checking the ceramic inserts on Atlantis’ windows and associated hardware (Forward Reaction Control System), after one of the tiny rings was observed as protruding on Endeavour’s Window 2 during STS-130. Similar checks took place on Discovery prior to her arrival at Pad 39A. 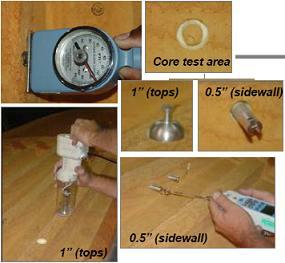 “Scheduled ceramic insert inspection/pull tests were completed. Crew hatch: All passed pull test but failed clearance requirement,” noted KSC Integration. “L/H FRCS: Four inserts inspected. All failed clearance requirement. Two failed pull test. Two were not pull tested due to platform in the way. A small amount of work has already been already been carried out on securing the inserts, although even Endeavour’s insert managed to remain in place all the way through entry and landing on STS-130. Other work taking place on Atlantis relates to rollover preparations, such as leak checks and inspections on the orbiter’s landing gear, which will be retracted for the final time less than a week prior to the orbiter’s ride to the VAB on the Orbiter Transporter System (OTS). “Nose Landing Gear (NLG) strut thruster installation was completed Friday. Thruster and forward ET attach bolt electrical connections were also completed on Friday. ECLSS (Environmental Control and Life Support System) nitrogen three day decay test started Monday,” added NASA Test Director (NTD) processing information (L2). With STS-132’s boosters – BI-143 (Booster Integration) and RSRM (Reusable Solid Rocket Motors) 111 – enjoying a nominal flow inside High Bay 1 (HB 1) of the VAB, the focus of processing reports have been on ET-136 in High Bay 2 East (HB-2 East). A problem with the tank was first reported in processing notes on March 12, when engineers noted a Problem Report (PR) had been charged against the -Y PAL Ramp during closeouts. “PR ET-136-TS-0012 was generated on -Y PAL ramp for foam de-lamination. Disposition is in signatures to R&R (Remove and Replace) ramp,” the opening note on the issue reported. Once the PAL ramp was removed the following day, it was noted the conathane – a type of foam sealant – did not appear to cure properly. Following its reapplication, the repair was left to cure. Nominal processing flow work on the tank is continuing, with the large 17 inch connections – which will be mated with Atlantis next month – undergoing checks. “LO2 / LH2 17” Disconnect Measurements/Adjust; Dew point sampling is worked complete, GHe purity sampling worked complete. 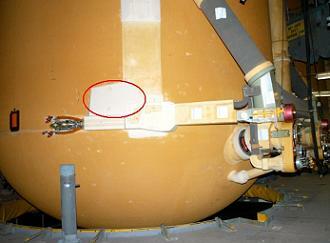 Leak checks are complete on the LO2 and LH2 umbilicals,” added the latest from the NTD on progress in the VAB. Good news was reported on the plug/pull tests conducted on ET-136’s intertank, tests which check the adhesive properties of the stringer foam and the intertank structure. These tests will continue on the downstream tanks, following several recent incidents of foam liberations from the intertank region during ascent. The root cause is believed to be related to contamination remaining on the structure prior to foam application at the Michoud Assembly Facility (MAF). However, mitigation work on access platforms – used by technicians to clean the giant structures – has been in effect since ET-136, and may result in no further foam losses being observed from this area of the tank.